Something is amiss with time. The Justice League is separated and sent throughout time, real and mythical, until the bulk of the team unites and seeks to set the world aright. Superman and The Batman have been succored by the Infinity Corporation, and plan their next move through time. Story - 4: The challenge of this book deserves a higher rating. It is Morrisonian in its construction i.e. requiring of more than a mere pass for full comprehension, and the promise of its ambition is very, very intriguing. 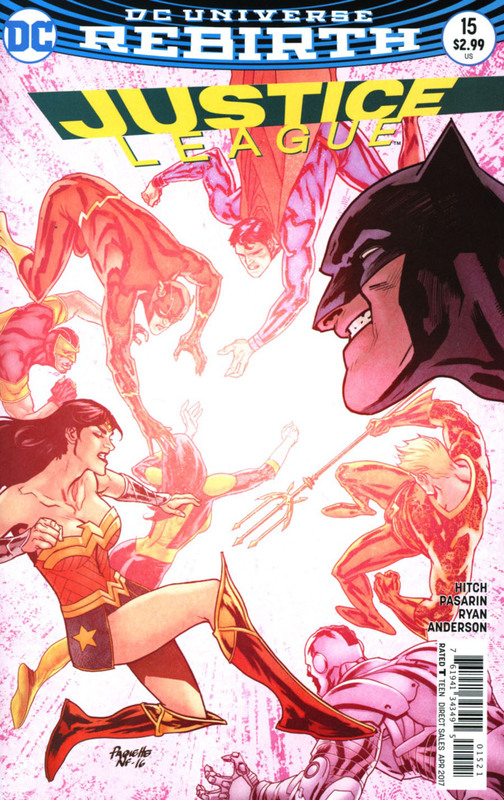 Still, it's reminiscent of Hitch's work on his unfinished Justice League of America. Hitch had Green Lantern in Krypton's past, while the rest of the League contended with the world spanning power of Rao. 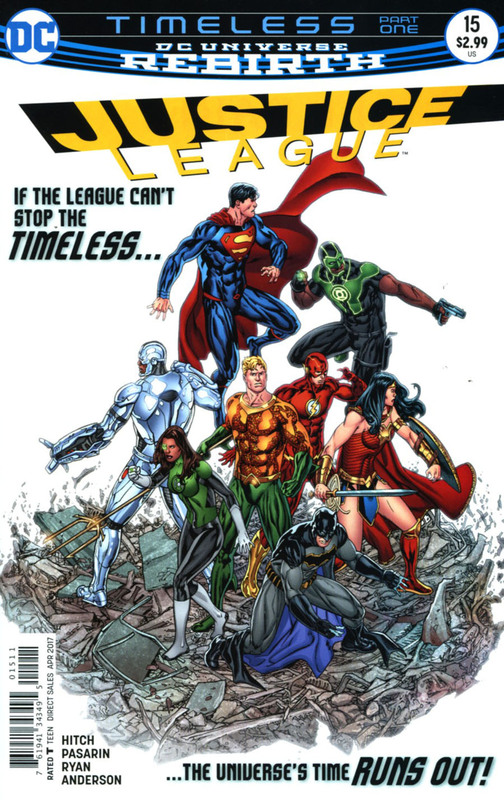 In "Timeless," once more, the League is separated and by time... with a world spanning event to contest. Hitch should be credited, and has been by this critic, for being ambitious in idea, and those ideas for the League have been sizable in their onset. However, the form and execution of those ideas have been unrewarding for the most part. It will be telling to see what "Timeless" shapes up to be, but again, Hitch deserves honorable mention for continually trying. Another writer would have gone formulaic at this point, and delivered a nice serving of Starro, Amazo, and Darkseid-O. Attempts cannot be rewarded, but they should be acknowledged, or at least acknowledged once, and this suffice on that count. Superman serves no purpose in this story, other than to continuously reminds readers that he wants to save Lois and Jon to the exclusion of the rest of the world. The aforementioned bad form is why marriage and children mixed with adventure characters are shunned by some. I don't want to see Superman bemoan being separated from his family, I want to see him attack the problem and find his way back to them. Have a read of Morrison's Superman Beyond. Superman is in similar straits, but he never makes it just about what he wants, but that's not Superman. Art - 4: The biggest failure is Superman's outfit, which is never rendered quite well, and is a constant reminder of why you don't mess with a classic. Cover Art - 4: It's an homage! Can you name the original cover. Check out the Comic Index Lists for the complete list of Superman-related comics published in 2017.